BVLGARI and Zaha Hadid celebrated the unveiling of a Serpenti installation inspired by Bulgari’s timeless icon during Milan Design Week. The evocative serpentine installation, created by visionary architect Zaha Hadid, will be featured in the garden of the Bulgari Hotel. 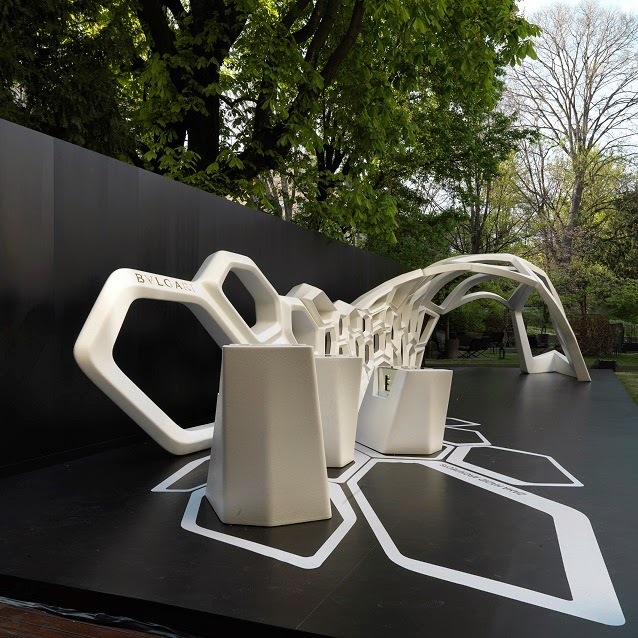 Zaha Hadid partnered with Bulgari to create an evocative Serpenti installation that celebrates the iconic snake. The 20m-long and 3m-high serpentine structure conveys the idea of sinuosity, and continual change. Seen through the rhythmic movement of figures, its curved lines of strength recall the scales of a snake. The structure’s combination of fluid and geometric forms, so typical of Hadid's architectural style is in perfect harmony with Bulgari’s own approach, as the jeweller is on a constant quest for balance, conjoining rigorous proportions with rounded shapes. The installation in the Bulgari Hotel garden expresses a happy synergy between the two visionaries of design. Melding with creativity, the polygons of Hadid’s structure will turn into veritable showcases, housing a selection of Bulgari Serpenti creations that date from the 1940s to today. The history of Serpenti will be unfurled within the dramatic sculpture, each scale a window to a mosaic of design history, all hailing the serpent. On the special occasion of the event, an extraordinary exhibition of Bulgari Serpenti creations dating from the 1960 up to the latest jewelry collection, was showcased within the polygonal elements of the structure. A star among these seductive treasures, the new Serpenti tubogas necklace in pink gold and pave diamonds, brilliantly coils the contemporary soul of tubogas with the shapely sinuosity of the snake. Zaha Hadid’s interpretation of the snake has also contaminated the Bulgari store in via Montenapoleone through Serpenti windows, specially designed for the occasion of Milan design week.